Warning: Using Ground Control Points is HIGHLY RECOMMENDED when processing a project with no image geolocation. 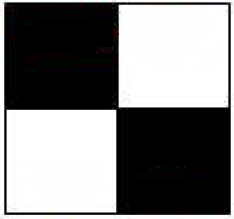 The final results have no scale, orientation, and absolute position information. Therefore they cannot be used for measurements, overlay, and comparison with previous results. The 3D reconstruction may not preserve the shape of the surveyed area. In projects with image geolocation: GCPs increase the absolute accuracy of a project, placing the model at the exact position on the Earth. They reduce the shift due to GPS from meters to centimeters. For more information about the shift due to GPS: How the onboard GPS affects the project accuracy?. In projects without image geolocation: GCPs are required if there is the need for georeferenced outputs. In this case, the GCPs will scale, orient and position the final results. Additionally, they are very useful for increasing the relative accuracy of the outputs, i.e. the reconstruction of the 3D model. The GCPs should be placed homogeneously in the area of interest. Imagine the area as a large table and the GCPs as the legs that will support it. If all the "legs" are placed at the same location of the "table," then it will tilt. If the "legs" are homogeneously spread, then the "table" will be stable. 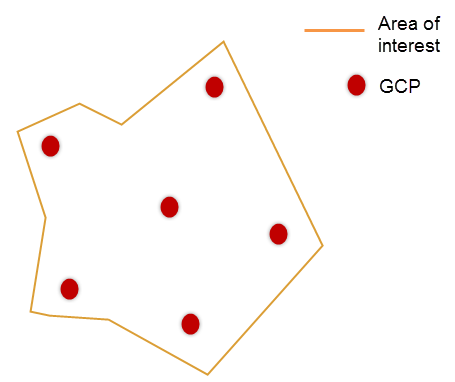 Additionally, it is also recommended to place one GCP in the center of the area in order to further increase the quality of the reconstruction (Figure 1). A minimum number of 3 GCPs is required for them be taken into account in the reconstruction. Each one should be marked in at least 2 images. A minimum number of 5 GCPs is recommended. 5 to 10 GCPs are usually enough, even for large projects. More GCPs do not contribute significantly to increasing the accuracy. In cases that the topography of the area is complex, then more GCPs will, indeed, lead to better (more accurate) reconstruction. It is recommended to use at least 5 GCPs, each of which is identified in 5 images, as it minimizes the measurement inaccuracies and helps to detect mistakes that may occur when inserting the GCPs. The GCPs should be placed evenly on the landscape to minimize the error in Scale and Orientation. Do not place the GCPs exactly at the edges of the area, as they will only be visible in few images. For corridor mapping: Number and distribution of ground control points (GCPs) in corridor mapping. Figure 1. Distribution of the GCPs. Global coordinate systems: They are defined using 3D ellipsoid coordinates (latitude, longitude, altitude). National coordinate systems: They are usually defined using a projection defined for a specific country (X, Y, altitude). Local coordinate systems: They are defined using a projection. The user sets the origin and orientation where it is most convenient (X, Y, altitude). Note: The altitude can be either geometric (using as reference the level of the ellipsoid) or orthometric (using as reference level the Mean Sea Level). For more information about the ellipsoid and orthometric height: Orthometric vs ellipsoidal height. Accuracy needed for the final results: The accuracy of the GCPs should correspond to the final absolute accuracy the user needs. For example, for projects for which an accuracy of some meters is acceptable (e.g. fast assessment tasks), then the accuracy of the GCPs is NOT required to be of some centimeters. For projects for which the accuracy is very important (e.g. construction sites) then the GCPs should be measured with an accuracy of some centimeters in order to comply with the project requirements. In general, the accuracy of the GCPs should be slightly better than the expected accuracy of the final results. Be visible in the images. The GCP photogrammetric target (figure 2) should have about five to ten times the dimensions of the GSD. If the GCP is natural (a characteristic point in the area that is not signed by a photogrammetric target), then the GCP can be even more difficult to identify and mark. Figure 2. GCP photogrammetric target. Not be more accurate than 1/10 of the GSD. For example, if the GSD is 10 cm, the GCP accuracy should not be below 1 cm, since they cannot be marked in the images with such accuracy. Important: The accuracy of the GCPs must be known in order to correctly set the GCP accuracy (Horizontal and Vertical) for processing. For more information about the GCP accuracy: GCP / Manual Tie Point Table. Total station accuracy: They can reach millimeters accuracy (depending on the distance of the measured points from the station). GPS system accuracy: They can reach several centimeters accuracy (depending on the equipment, the area, and the country). If no GCPs have been measured in the field, they can be extracted from other sources. The advantage of such GCPs is that they can be extracted at any time while being at the office. The disadvantage is that they give no control over the accuracy and that the coordinate system is the coordinate system of the GCP source. GCPs extracted from high accuracy sources: GCPs can be extracted from sources such as existing maps and laser scanning outputs of the same area. If these sources are updated, then the GCPs can be very accurate. The coordinate system and the accuracy of these points depend on the source. The images are not geolocated and therefore the project has no georeference. The desired output is a .kml file, which can align perfectly with Google Maps. For more information about how to obtain the georeference using 2D or 3D GCPs taken from a Web Map Service server: How to obtain the georeference using 2D or 3D GCPs taken from a Web Map Service .